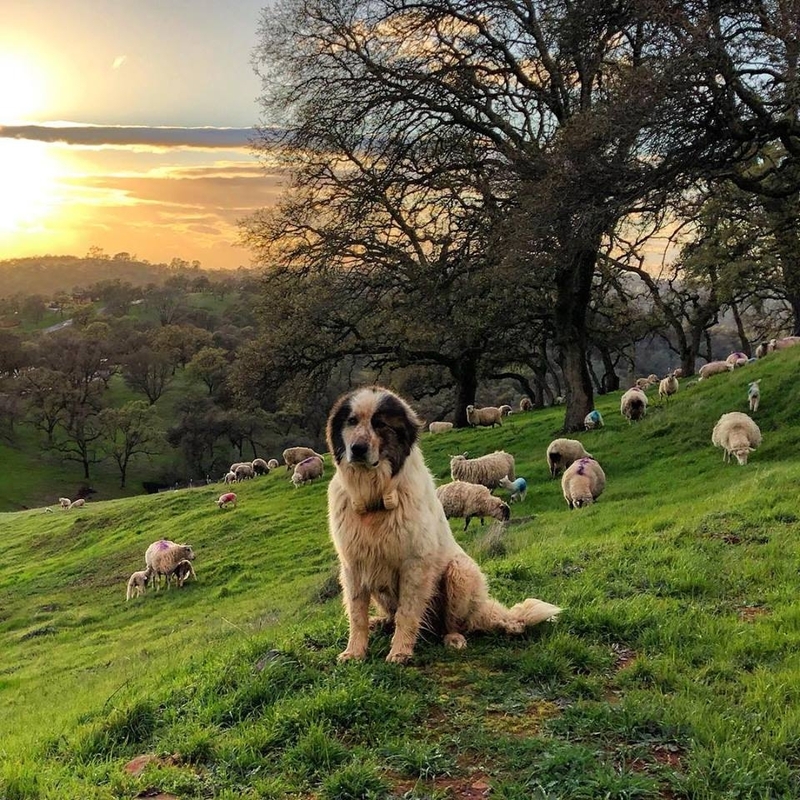 I realized this morning that it's been some time (nearly a year, in fact) since I posted an update on my progress with our youngest livestock guardian dog, Elko. In case you missed the first five installments of this journal, Elko is a Pyr x Akbash dog we acquired from Fred Groverman in Petaluma in September 2017. I've been tracking our progress in his development. This weekend marked a significant step in Elko's development. During the last week of March, I traveled through northeastern California talking about (and more importantly, learning about) protecting livestock from predators. Thanks to a Renewable Resources Extension Act grant, a number of my UC Cooperative Extension colleagues and I were able to bring some folks with experience dealing with wolves and grizzly bears in Wyoming and Montana to share their perspectives with California ranchers. During our formal workshops - and during the 700+ miles we traveled together - I learned a tremendous amount! George Edwards is the executive director of the Montana Livestock Loss Board, a state program that compensates ranchers for losses to wolves, mountain lions, and grizzly bears. George provided invaluable insights into why a compensation program makes sense - and into the types of tools that ranchers are using in Montana to avoid these losses. He shared this outstanding video about an innovative carcass disposal program in western Montana. I first met Cat Urbigkit nearly 10 years ago at an American Sheep Industry conference in Reno. I've since had the chance to get to know Cat as a fellow producer and friend. Her experiences using livestock guardian dogs to protect both sheep and cattle from large carnivores - including gray wolves and grizzlies - was especially enlightening. Now that I've had a few weeks to reflect on what I learned, my own experiences with livestock guardian dogs have come into clearer focus. Cat emphasized that no two dogs are alike - just as no two livestock operations are alike. A dog that will work for Cat in western Wyoming may not be a good fit for me in the foothills of the Sierra Nevada; similarly, my dogs may not work well in Cat's extensive rangeland environment. In other words, a dog "trained" by someone else - that is, bonded with someone else's livestock in their environment - won't necessarily stay with my sheep. I have not been successful in outsourcing the critical bonding period. My dogs have to bond with my sheep. 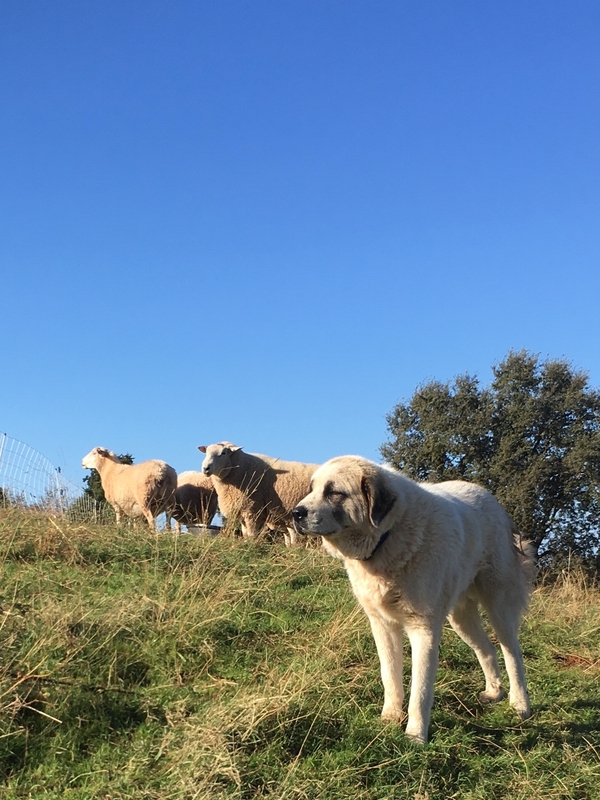 Livestock guardian dogs, as Cat says, are "dogs of nature." Rather than "training" them, we must give them the opportunity to fully express their own instincts. They should smell, hear, and see the livestock they'll spend their lives protecting from the earliest possible moment. 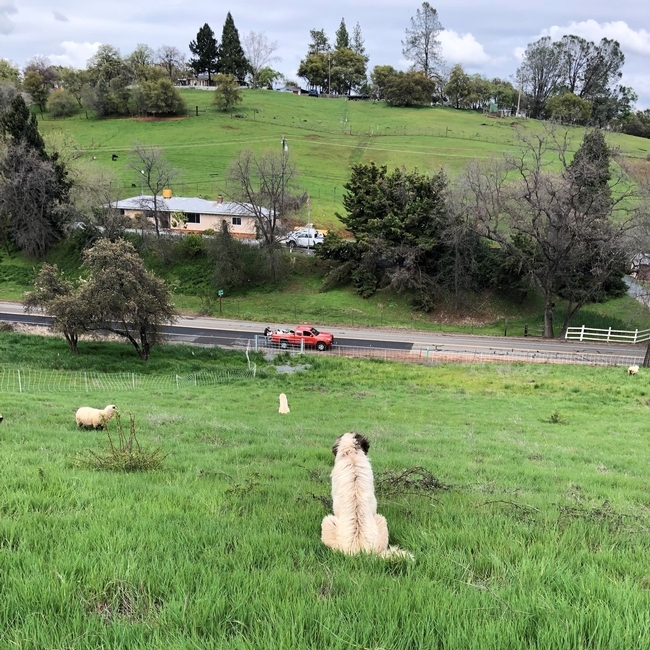 I've written previously that I think this means that my dogs need to bond with my sheep and my system (electric fenced paddocks in the urban-rural interface). I think that's not quite right, however. After visiting with Cat, I think the bond between dog and my sheep is the most critical component. My dogs stay with my sheep because of their bond - not because of my fence. The dogs I used early in my shepherding career roamed because I hadn't allowed them to bond properly, I suspect. And this bonding process has to happen on my operation - a livestock guardian dog "specialist" who isn't also a rancher can't duplicate my specific conditions. 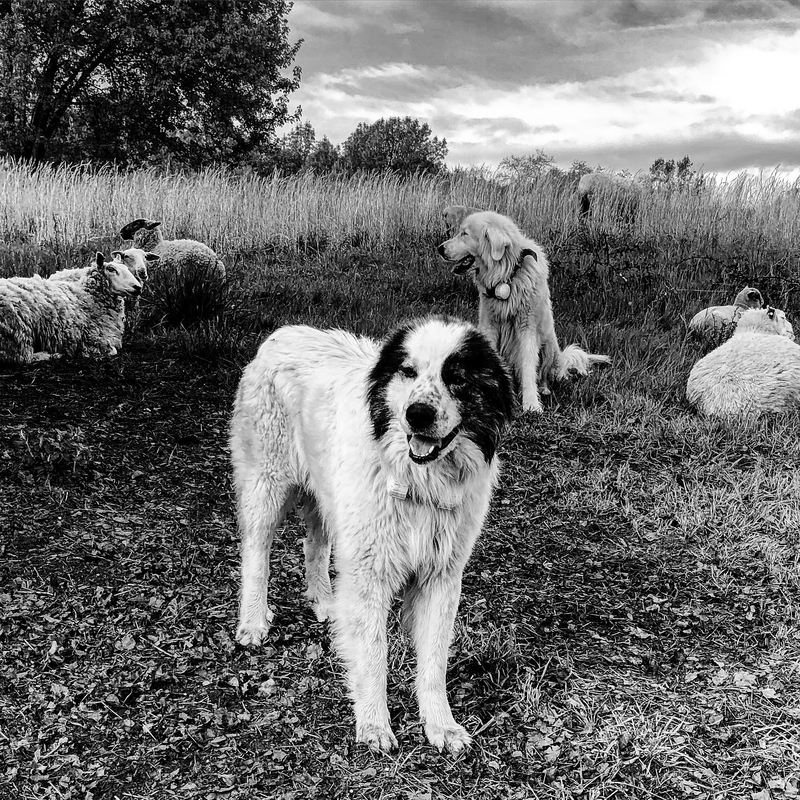 Elko spent last summer with our dry ewes in the company of another LGD, Bodie. When we split our sheep into separate breeding groups in late September, Elko (who was then just over a year old) went with his own group of ewes. About a week into our breeding season, we suspect we lost a ewe in Bodie's group to a coyote attack (in a paddock with low visibility due to vegetation). We put Elko with Bodie at that point, with good results. Bodie, who we know we can trust with lambing ewes, stayed with the ewes through the winter and during lambing. Once we separated the rams from the ewes in mid-November, Elko stayed with the rams until this past Saturday. The rams went home to be shorn; the ewes and lambs went to irrigated pasture - and Elko joined Bodie as part of his "final exam." Last year, we put Bodie with an older dog at the beginning of lambing season (here's a video link). The older dog, Reno, chased Bodie away from lambing ewes, which helped Bodie understand what was expected of him. By coincidence, our last ewe lambed on Saturday shortly after we put Elko with Bodie and the ewe flock - and I observed Bodie provide similar training. Bodie would not let Elko get too close to the ewe and her new lambs. I suspect that this was at least partly because Bodie wanted to eat the afterbirth; regardless, the result was that Elko learned to respect a lambing ewe's "personal space." Elko's training is not completed - he's still in the canine equivalent of his late teen years. At the risk of anthropomorphizing our LGDs, I know that I didn't always make the best decisions in my late teen years - we'll keep a close eye on Elko while he's with the lambs and ewes. That said, this weekend he passed a significant test! A final note on costs - Elko cost us $525.35 to acquire (cost of puppy + mileage). Through Saturday, we've spent $526.44 on vaccinations and dog food. Also - here's a link to a new fact sheet on LGDs we developed as part of our grant-funded project. Whenever I'm asked to talk about livestock and predators with a non-ranching group, I poll the audience about what predators give me the most problems in our sheep operation. Most say coyotes, some say mountain lions; inevitably, a few say black bears. And they're almost always surprised when I explain that the single worst depredation loss we've ever suffered was to a neighbor's dog. We have grazed our sheep in some fairly remote environments. 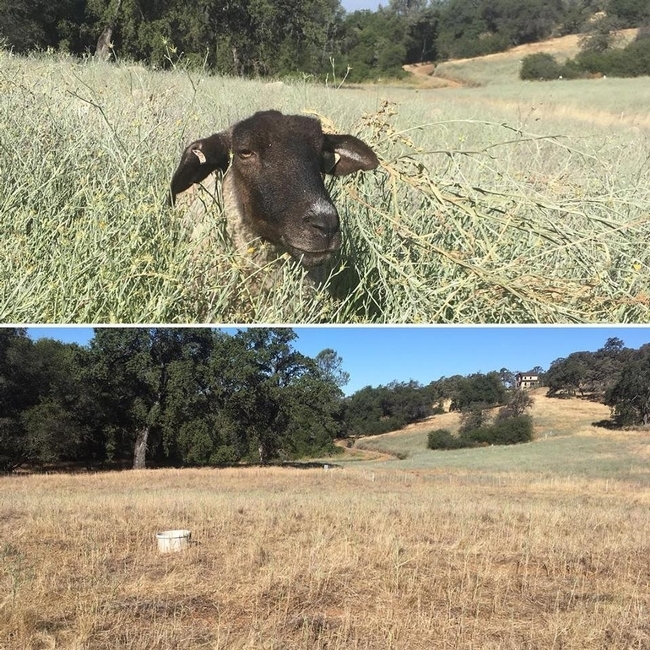 From my own observations (and from looking at game camera photos as part of my livestock guardian dog research), I know that coyotes, foxes and bobcats do exist in close proximity to our sheep. I'm also certain there are mountain lions in our environment. But early one morning eight years ago, a neighbor's dog came into our back field at home (where we had just a handful of sheep, but no guardian dog) and killed four ewes. Another neighbor saw the attack and let us know. When I spoke with the dog's owner, he said, "My dog would never do that," and yet we found blood and wool in the dog's teeth. Domestic dogs seem to chase livestock for enjoyment rather than out of hunger. In addition, dogs tend not to be very skilled at killing livestock. Consequently, the damage dogs inflict is often far more gruesome than that inflicted by a wild predator. As with wild predators, some of the impacts from a dog attack may be indirect - that is, the stress of the attack may cause cows (or ewes or does) to abort their pregnancies. Feeder livestock that are worried by dogs may not gain as much weight. I've had to repair or replace electric fencing through which my sheep ran while being chased by a dog. The livestock owner is not subject to any criminal or civil action as a consequence of killing or seizing a dog in these circumstances. In addition to these state laws, most counties have additional ordinances permitting animal control officers to capture or kill dogs found to be killing, injuring, worrying, or pursuing livestock. While I find it helpful to understand the legal aspects of this problem, the cold, objective language of the law doesn't necessarily make my emotional response any easier. I love dogs; indeed, I rely on border collies and livestock guardian dogs every day. My border collies are also my pets - and I would hate to think about someone else killing my pet. But I also value my sheep - I think all of us who raise livestock have an emotional attachment to the animals in our care. To further complicate these matters, the dogs that we find chasing our livestock often belong to neighbors - people who we see at the mailbox or whose kids go to the same school as our kids. For me, I guess, the question becomes, "How do we prevent this from happening?" Yesterday, I took a call from a friend who had just caught a neighbor's dog chasing his heifers. He knew the dog, and he knew the dog's owner. He was able to have a rational but direct conversation with the dog's owner about the problem, about the extent of her liability, and about what he would be forced to do if the dog continued to be a problem. He reported that the conversation was productive (largely, I expect, because he controlled his emotions). As I thought about his example over the last 24 hours, as well as my own experiences with this problem, I've developed some ideas about how we can (hopefully) avoid these problems. I hope others will share ideas as well! We should get to know our neighbors and their dogs. Since many of us graze livestock on leased properties some distance from our home places, these neighbors can help watch for strange dogs (and other problems). I've started to try to introduce myself to neighbors when we take on a new grazing lease. Many neighbors now call me if they notice something unusual. Explain to neighbors, dog-walkers who may not have their dogs on a leash, and others, that pet dogs can (and will) chase livestock if given the opportunity. What may seem like a "cute" game is in fact stressing our livestock. We should take the time to describe how this stress affects the well-being of our animals. Consider putting up a sign asking folks to keep their dogs on a leash. If an attack happens, I hope I can follow my friend's example. These are difficult conversations; remaining calm while explaining the impacts - and noting what will happen if the problem continues - is critical. Get to know the animal control officers who work in your area - they can often provide help with these issues. I sometimes get a call from our local officers when there has been a problem dog in the vicinity of our sheep. If you're walking your dog close to livestock, please keep it on a leash. If your dog gets away from you (or gets out of your yard) and chases livestock, please make an effort to contact the livestock owner. Taking responsibility is an important first step towards starting an objective conversation. Keep an eye out for stray dogs in your neighborhood, especially if there are livestock grazing nearby. Let animal control and the livestock owner know about the dog, if possible. If you have questions about this issue, contact your local animal control department or agriculture department at the numbers below. While Leptospirosis is a bacterial infection that can occurs worldwide, it is more common in tropical and sub-tropical areas. For example, Leptospirosis is a relatively frequent disease in Mexico. In California, Leptospirosis is an emergent disease, which could be explained (at least in part) by our changing climate. Leptospirosis is caused by spiral-shaped bacteria that can cause damage to the liver, kidneys, and other organs of animals and humans. Cases usually occur in the summer and fall; large outbreaks have occurred after flooding. Leptospirosis is not spread from person to person, but from animals to humans through the urine of infected animals, which gets into soil or water. Humans and animals can become infected through direct contact with this contaminated soil or water, where the bacteria can survive for some months. The bacteria can also enter through cuts in the skin, through the mucous membranes or through drinking water. In cattle, sheep, goats and swine, symptoms of Leptospirosis may include fever and reproductive problems (e.g., abortions). In humans, symptoms can range from mild to severe (including flu-like illness, weakness, vomiting, mental confusion, jaundice, and stiff neck). Most people who become infected have no symptoms or may confuse their symptoms with a simple cold. Unfortunately, some people may develop more significant problems from Leptospirosis. Vaccines are currently available for livestock and dogs – these vaccines can help prevent disease severity but may not complete prevent infection. We can protect our own health by preventing and controlling infection in our livestock. In addition, rodents can be a reservoir of the disease, so rodent control is important. Don't handle urine, blood, or tissues from infected animals – wear protective clothing, especially gloves! And always wash up after handling animals! As you might imagine, Leptospirosis is primarily an occupational disease in humans – in other words, those of us who work directly with animals, contaminated soil, or stagnant water can be at greater risk. 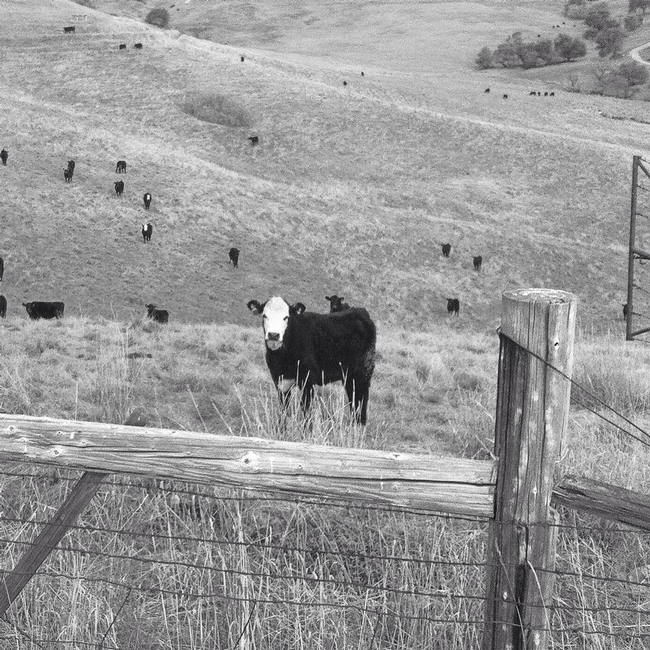 Half of California cattle herds have been estimated to be infected with Leptospira, which can be a serious threat to livestock producers and ranch employees. Active epidemiological surveillance has been repeatedly recommended, but surprisingly, no studies on Leptospirosis have been conducted in California agriculture workers. As a result, the Center for Health and the Environment at UC Davis is studying the prevalence of the disease in farmers and ranchers, farm workers, and veterinarians. This study will help researchers better understand the main exposure factors. The Center is looking for volunteers to participate in the study. Working in agriculture, or in close contact with livestock. You must not have been sick during the last five weeks. If you decide to participate in the study, researchers will ask some questions about your occupation and work history. You will also be asked to provide a blood sample. The questionnaire and the blood draw will take about 30 minutes. After you have answered the questions and a professional has taken your blood sample in a health facility, you will receive $60 in compensation. The survey and blood collection are completely anonymous.